In this June 12, 2015, file photo, a hardshell lobster, left, and soft-shelled "shedder" look nearly identical prior to being boiled at the Clam Shack in Kennebunkport, Maine. 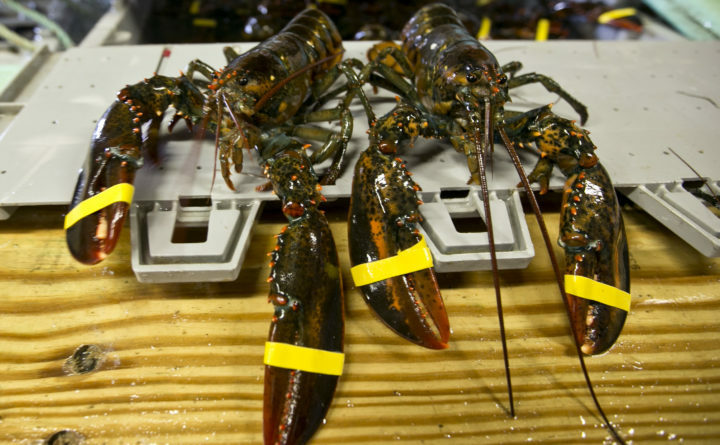 A set of retaliatory tariffs released by China includes a plan to tax American lobster exports, potentially jeopardizing one of the biggest markets for the premium seafood. Chinese officials announced the planned lobster tariff, Friday, June 15, 2018, along with hundreds of others amid the country's escalating trade fight with the United States. Maine’s lobster industry is on watch as fisheries regulators weigh whether to make significant cuts to herring catch limits, which could drive up bait costs that have already seen a sharp increase over the past decade. Maine’s lobstermen draw their bait from the Atlantic herring stocks, which are managed by the New England Fishery Management Council and National Marine Fisheries Service. In recent updates, the council said it planned on setting a significantly lower herring catch quota in 2019 than in 2018. The catch limit for 2018 was 111,000 metric tons, the same as it was in 2017. But the herring fleet landed many fewer fish than that last year, harvesting just 50,000 metric tons. The council also called for a reduction to the catch cap for the rest of 2018 amid concerns about low densities and slow replenishment in the fish stock. A herring stock assessment group held meetings in late June to try to determine its next steps and come closer to determining what quota it might propose. The group should release more details about the expected catch limits in the fall. The prospect of a shortage of herring, the preferred and primary bait source for Maine’s lobstering fleet, has lobstermen worried about the possibility of dwindling supply driving up prices. In some areas, herring might not be available when lobstermen are looking for it. Many are considering whether they’ll have to turn to alternative baits or stockpile while supplies are still available. In June, the International Council for Exploration of the Seas recommended chopping North Sea herring catch quotas by 40 percent — from 491,355 metric tons to 291,040 metric tons — in 2019. That proposal sparked concern about herring supply and the state of the fishery in Europe. If herring become harder to come by on Maine docks, it could push more lobstermen toward menhaden, also known as pogies, the second-most-popular bait in the fishery. That shift could put a strain on menhaden supply and drive those prices up, which could in turn prompt lobstermen to seek out other bait sources that could run into their own supply-and-demand challenges. Over the past decade, herring catches have dropped about 40 percent. The price of the bait fish has climbed about 80 percent during that same period, according to Patrice McCarron, the Maine Lobstermen’s Association executive director. “We’ve definitely seen diversification in the bait supply, but the price of all bait products is going up, and herring is kind of driving it,” McCarron added. It’s possible that a pair of onshore salmon farms planned for Maine, one in Belfast and the other in Bucksport, could open up a new bait source for the lobster industry. Belfast-based Nordic Aquafarms has been speaking with officials in the lobster industry about the potential for selling salmon guts and other “cut-offs” to fishermen after processing. Those salmon will need to be fed. The farms are still working out details of what will go into the feed they give to the salmon. Traditionally, salmon feed has been made from protein and oil from other types of fish, though some feed producers have ramped up the plant material in the feed and used alternative protein sources, such as insects. Nordic has said it won’t source its feed fish stocks from New England or Maine waters, but is still working out details.